Once the plugin has been installed and enabled, you can find your partial payment settings on your WooCommerce > Settings page under the “Checkout” tab. You will need to scroll down under the settings where you sort your active gateways. But before you start changing your setup, make sure that you have enabled the use of coupons! WooCommerce will update the checkout page and the order total automatically when a coupon is added or removed. 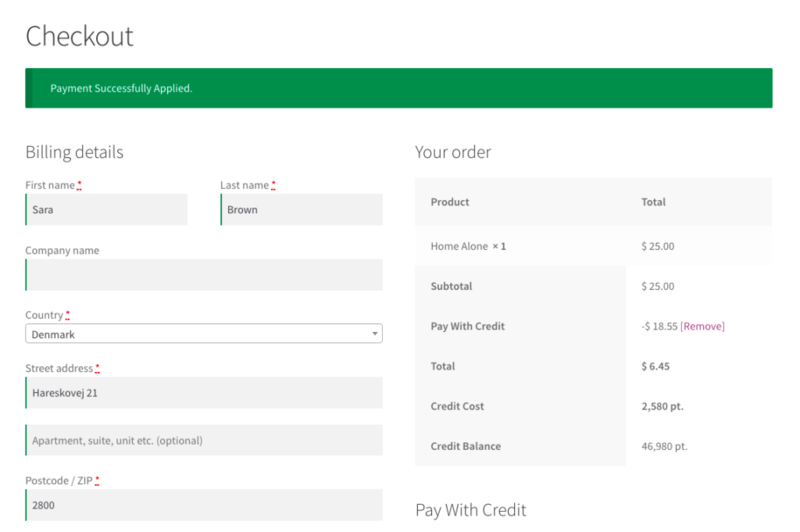 First, we need to select if we want to show the payment form above or below the total table on the checkout page. If you prefer, you can also select to disable and insert the form yourself using your WooCommerce theme files. Next we need to select which point type we want to accept as payment and the exchange rate between the selected point type and your store currency. Next you are given the option to set a minimum payment requirement. This minimum is only enforced if the user want to make a partial payment. They can still checkout without making any point payment what-so-ever. We can also enforce a maximum cap where a user can only pay for a certain percentage of the order total. This would mean the user would need to make some form of payment using some other payment gateway. Next you need to decide if users can make multiple payments and if they can undo their payments. Undoing a payment will result in the points being fully refunded to the users account. If you are using store rewards in myCRED, you can select if the point amount the user pays is deducted or not from the payout. If the user themselves or your website via some plugin empties their cart, any partial payments that has been applied to the cart will be automatically refunded. Next, we need to decide what points can be used as payment for. You can select if points can pay for taxes (if used), shipping (if applicable) or products that are marked as “on sale” in WooCommerce. After that, we need to select if we want to use an input field where a user needs to type in the amount they want to spend or if we want to use a convenient slider. Both can be set to have a “step” value which dictates how much the point amount increments. If you use the input field options, your users can of course type in any amount, the increment only works when you click on the up or down button inside the input field. As the user types in an amount or moves the slider, they will be able to see above how many points they chosen and the amount it gives in discount. Next you are given the option to insert a title and description that are inserted above the input field / slider in the form, along with changing the button label. Finally we need to set some log entry templates. 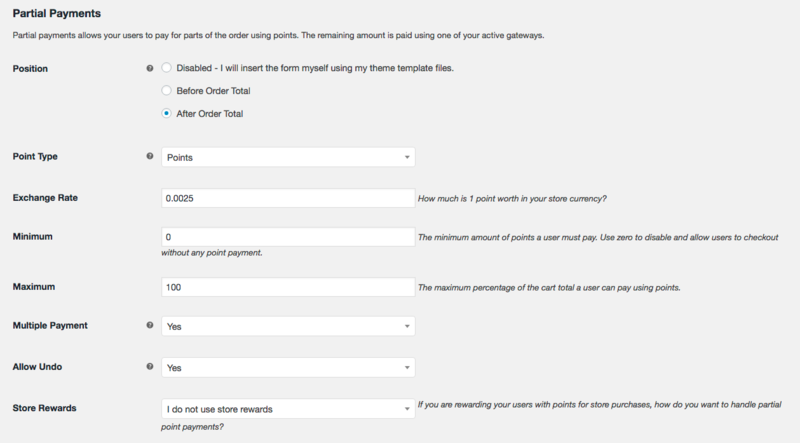 These templates are what your customers will see in their points history (if shown). These fields are mandatory and can not be left empty! If you do, the user will be charged the point amount but there will be no record of the payment and will result in no refunds! Remember to save when ready!